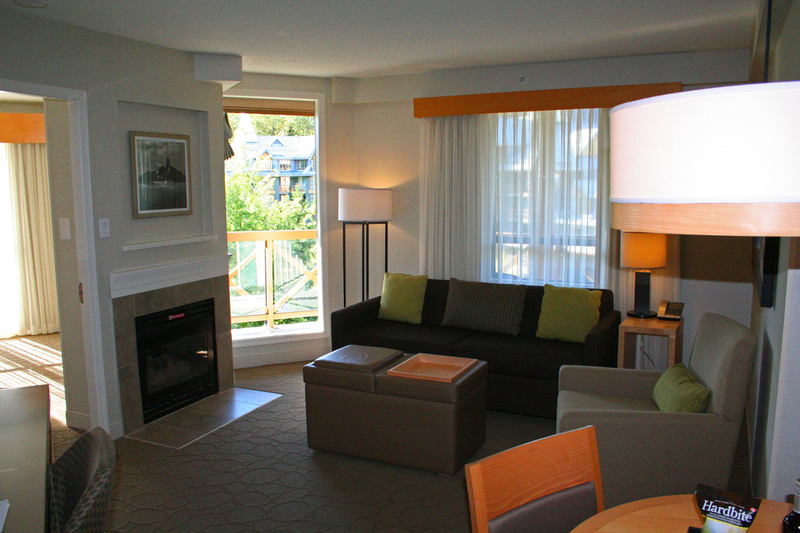 In need of a “guys’ getaway,” one of my adult sons and I booked a two-bedroom suite at the Delta Whistler Village Suites. It is a beautiful property in an excellent location but is somewhat lacking in upmarket refinements. Visiting during the fall shoulder season, our accommodations were priced very reasonably for a high-end property. Our three-night stay over a Wednesday, Thursday and Friday night averaged CAN$330 per night, or about US$250 at current exchange rates. Underground garage parking was another CAN$30, or US$20 per night. Our suite had two bedrooms of about 150 square feet each. 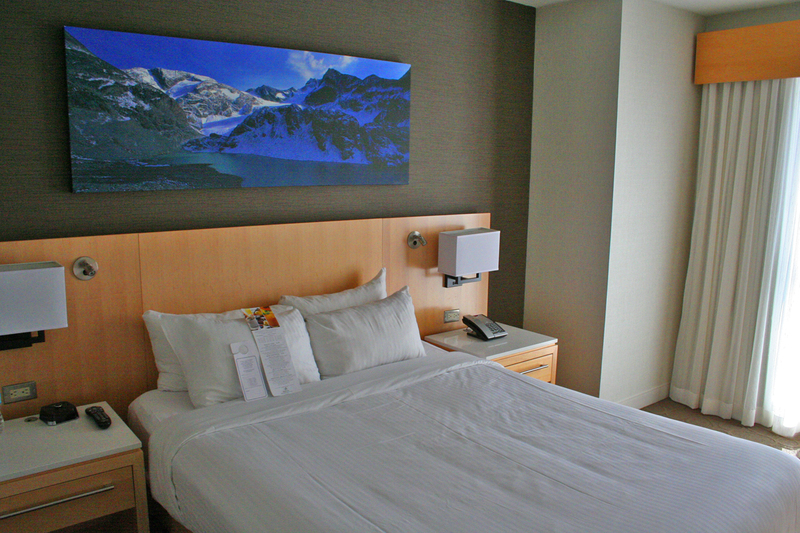 Both rooms had adjoining bathrooms and were equipped with high-definition televisions. The suite also had a living room of about 17 by 13 feet with a writing desk, SmartDesk that offered both wired and wireless internet access, a VGA connection to the high-def TV, audio connection, HDMI connection and composite A/V connection. Internet connectivity was very good. Wi-Fi download speeds were 5.3 Mbps per Speakesasy.net/SpeedTest but the wired connection on the SmartDesk provided download speeds of a blazing 80.36 Mbps. Upload speeds were similarly impressive. The room had other amenities we expect today, including bathrobes waiting in the rooms, an iron and ironing board, high-end bath soaps and lotions, and even a washer and dryer. A balcony provided excellent, unobstructed views of the nearby mountains. The suite also had a complete, fully equipped kitchen. The closets were smaller than one would expect in such a generous suite and I had to take the provided ironing board out to make enough room for the few clothes I’d packed. 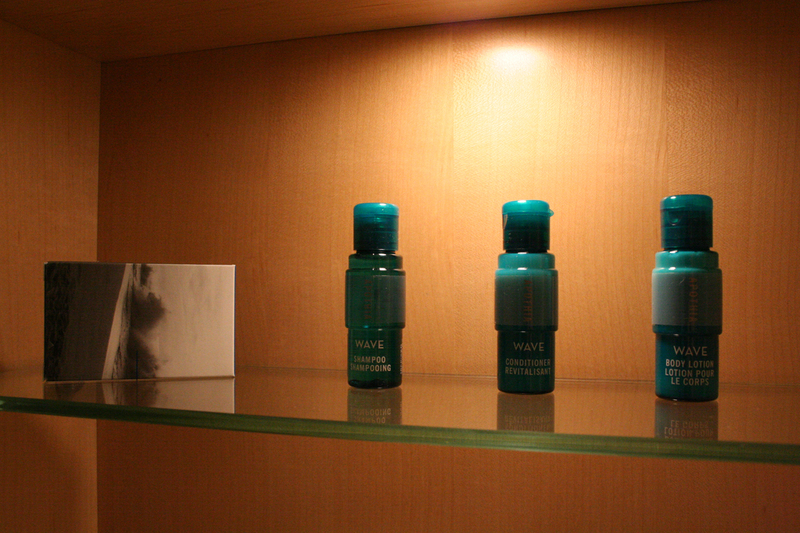 Our room had an increasingly rare minibar with prices that were quite modest compared to other hotel minibars. A split of red wine was $16, chips $3, a Cliff bar was $3.50 and sodas were $2. Bottled water was complimentary. While those prices were slightly higher than at the nearby groceries, the additional cost was, we felt, a very reasonable “convenience premium” for the items offered. When I am traveling, I absolutely hate returning to a room that has not been made up, particularly when I have been absent for hours. 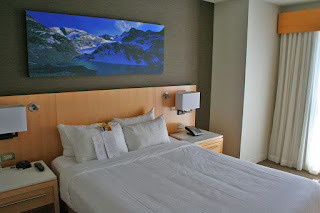 The Delta Whistler Village Suites has handy door hangers that enable guests to specify the time they would like housekeeping to attend to their room, or to indicate that no service is required. A very nice touch, that! On the ground floor the hotel has a modest fitness center, a dry sauna, and indoor hot tub, indoor/outdoor swimming pool (heated, of course) and two more hot tubs outdoors. Men’s and women’s locker rooms offer changing facilities, lockers, showers and abundant towels. The property’s lobby was under renovation at the time of our visit and the business center was unavailable but, as we were on vacation, that was not an issue. Guest rooms, we were told, had been recently renovated and the common areas, including the hallways, would be the last to be refreshed. At present, the halls are tired, with walls showing significant signs of wear. The hotel shares its building with two dining venues: The Brickworks Public House featuring pub grub and Hy’s Steakhouse, a white table cloth steak and chop house with five locations across Canada. One of the drawbacks for those expecting an adult vacation is that many establishments in Whistler allow kids under legal age in bar areas of restaurants or in pubs until fairly late in the evening. 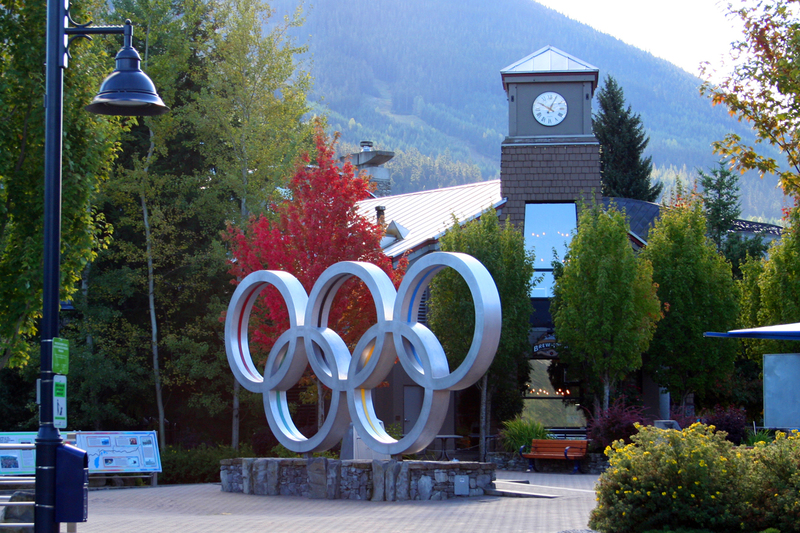 Accordingly, adults-only environments are more difficult to find in Whistler than in other places. Specific to the hotel, among the most important aspects of a stay at a higher end property is the level of service staff members provide. The best hotels and staff members make their visitors feel like honored guests rather than paying customers. In addition, the service they provide is top notch. The desk clerks who checked us in and checked us out as well as our housekeeping attendant made me feel welcome and valued while others missed that mark. The valet was polite and his directions clear and helpful, but he lacked that special je ne sais quoi that made us feel like welcome guests. The concierge was far less helpful than one would expect at an upmarket property. She did not have maps available to direct guests to The Whistler Train Wreck, a popular destination about seven kilometers from the village, and her instructions jotted on the map were somewhat less than clear. On other occasions, she didn’t seem to grasp what we were asking, including whether there was a particular bicycle shop they recommended for bike rentals, as many hotels cultivate relationships with preferred providers. While this one did not have a particular shop to recommend, we were give 10 percent discount coupons which were good at those shops affiliated with Whistler-Blackcomb, Inc., but at none of the independent shops. The hotel needs to pay closer attention to detail when it comes to the physical plant. There were several minor issues with one of the bathrooms that should have been corrected: the door did not close properly, one of the towel racks was coming off the wall, the vents to the provided hair dryer were caked with dust and lint, and one of the two fixtures on either side of the mirror were misaligned. One of the bedside power outlets did not work and the bedside clock was slow with no obvious way for the guest to reset it. Individually, these are very small things but when a guest is paying more than CAN$300 per night, particularly at a property that displays plaques in its lobby boasting of the awards it has received, they simply should not happen. 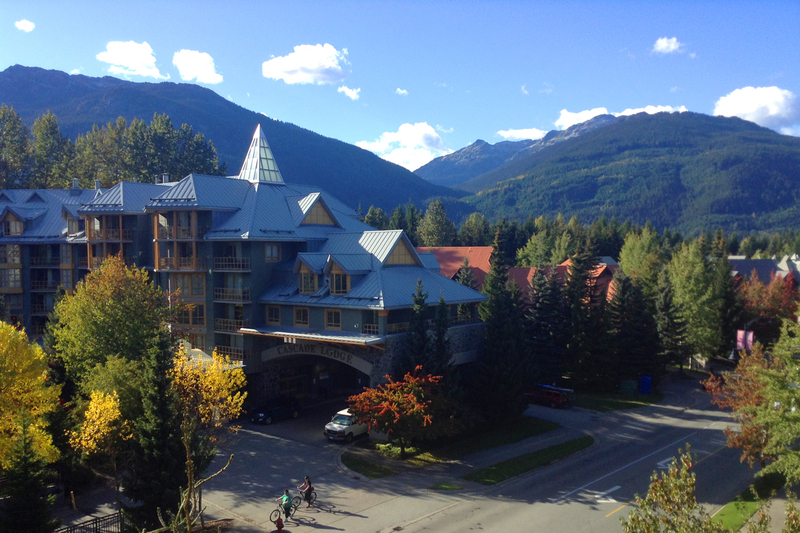 Finally, visitors should bear in mind that prepaid packages are common in resort areas, and Whistler is definitely a resort area. Our package gave us a no-penalty cancellation period up to two days before arrival but that will vary depending on the days of the week being reserved and length of stay, among other factors. According to the Marriott.com web site, rooms booked for weekend stays may carry a cancellation period as short as 24 hours after booking. Be sure you understand the terms and conditions before booking. In sum, the Delta Whistler Village Suites has much to recommend it and I would stay there again without hesitation. However, some fine-tuning is needed before I would characterize it as a truly upmarket property.